Your will designates who is to receive your possessions and assets when you pass away. If you die without leaving a properly executed will, confusion or uncertainty may arise regarding the distribution of your property and how your physical remains should be handled. A will does not have to be signed by a notary public to be legally binding, but a notary's signature helps to establish the validity of your will. 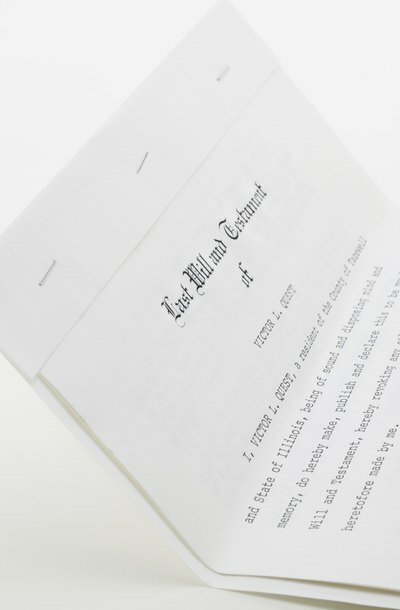 Handwrite or type a title for your will, such as "Last Will and Testament." Below this title, write your full legal name, your present home address and your Social Security number or other identifying information such as your date of birth. Write a paragraph affirming that you are of sound mind and memory at the time of writing the will; your wishes are expressed in the document without undue duress or influence from any other person; all previous wills are now revoked; and at the time of writing the will, you are of legal age to create a will. In most U.S. states, the minimum age to write a will is 18. The exceptions are Louisiana (age 16), Georgia (age 14) and South Dakota, which has a higher minimum age. Designate an executor for your will. You can also name an alternate executor to serve if your first choice is unwilling or unavailable. Often, the executor is either your spouse or the principal beneficiary of your will. Name your beneficiaries in your will. Explicitly state what possessions or assets you wish to bequeath to each person, and make sure their identities are clear – use a full name and date of birth to identify each beneficiary. If you have a spouse and do not wish to make that individual a beneficiary of your will, you should seek legal counsel for advice on how to exclude your spouse from your will. Specify any wishes you have as to your funeral arrangements. If you have specific desires for how your remains should be handled, state them in the will. Place your signature at the end of the will. Your signature should be preceded by a statement that you signed the will before designated witnesses on a particular date. Do not sign the will until your witnesses are present. Leave a signature space for a notary public. Secure the services of a notary public before you sign your will. Many bank branches have notaries on staff, as do most law firms. Take your will to the notary's office and sign in the presence of the notary and your witnesses. The 'Lectric Law Library: What Are the Requirements for Making A Will? National Notary Association: What Is a Notary?